First African American female Public Librarian in Philadelphia, Pennsylvania (1943). First African American female School Librarian in Philadelphia, Pennsylvania. Her story is one of perseverance as she was denied admission to Drexel University in Philadelphia in 1940 due to her race. 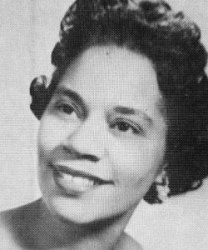 Never unwavering in her commitment to achieve her dream, she applied to and was successfully admitted to Atlanta University Library School where she earned a Bachelor in Library Science and Service in 1943. She returned to Philadelphia in 1943 and was appointed the city\'s first black librarian shortly thereafter.